Besides giving great haircuts and doing the best coloring I have had done anywhere, Valerie is patient and accommodating! (now the world knows I color my hair!). Solo is a great choice--for young or old! Awesome! Val and the staff are always friendly. Best of all-- the haircuts. I go I with a basic idea and leave with awesome layers Everytime! I have been coming to Val for 25 years, and I am never disappointed. Even when I walk in feeling miserable about my hair, I walk out feeling beautiful! This time I wanted to try highlights. She talked me into a lighter color, used her new technique and the results are amazing. Next time I am going even lighter like she suggested! Val has the best eye for finding the style that is perfect for you, and she continues to keep abreast of all the latest techniques! You are in great hands at Solo. Thanks, Val! Val is the best at what she does! I always know that when I leave solo my hair will look fabulous and I will feel great! She is a master when it comes to color and has a talent for styling and cutting any type of hair. She is always up to date on the latest hair trends and fashion. I have known Val and have been going to solo for years and can tell you first hand that you won't get a better cut/color/ style anywhere else! Val is the best! Never trusted a stylist the way I trust her! She has great recommendations and is always up on the latest products to keep your hair healthy. As always I had a great experience. And did I say that Val cuts my wife's and my 21 year old daughter's hair as well? Val always does a fabulous job on my hair Knows just what my hair needs to loom great Also a fun person to spend time with during the appointment. I loved it and I love my hair cut!!! Val is a true professional. Each client is treated as part of her family. I would never consider going anyplace else for my hair cut. Thanks Val for making me beautiful. I just love what you have done with my hair...from the color to the cut. You are a true artist. Val has been my stylist for years and even though I moved out of the area, I wouldn't dream of going anywhere else. 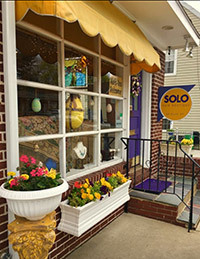 If you want a wonderful cut and color and a warm, welcoming experience, Solo is the place! Great Cuts and coloring. Pleasant environment. Val is a great person and a fantastic hair Dresser. Val has cut my hair for the past 25 years and I have followed her from Philly to Haddonfield. I am constantly getting compliments on my haircut from friends and strangers. She makes me feel beautiful and she is a beautiful person. The shop is relaxing and it is just a great experience to have Val do your hair. When you go to solo you don't just get a custom cut or color to suit your personality, you get a an experience. From the warm comfort of this salon, music and beverages, you get the full attention of Val (and her little puppy, who will relax and inspire you. 12 years and always a pleasure to take the drive to Solo. You get more than what you pay for; Solo is my only salon. Great cuts and a relaxed atmosphere, Val's boutique is the best! Solo Hair Boutique provides a calm and relaxing environment while you are styled by the amazing Valerie. No hustle and bustle of a busy salon flooded the echoes and cold surfaces. Valerie caters to her clients' wants and needs. You will not be disappointed. I love the personal service at Solo. Valerie's focus is on me as the client. At other salons I've felt rushed in or out and handed from one person to the next. This NEVER happens with Valerie. I've gotten so many compliments on the way my hair is cut and the color is so natural. No more salon hopping for me - Valerie knows what she's doing. Really personal service! Friendly, relaxed atmosphere. I have VERY CURLY hair. Frizz, not pretty ringlets. I went to Valerie after I had a horrible incident from another salon and one person in particular. I had to let me hair go back to curly with no blow drying or putting any chemicals in my hair to allow it to repair. So I had to find someone who knew how to cut very curly hair, in a style that looked good on me. It is not easy to find anyone that knows how to cut curly hair in more than one style or even know how to a good job in that one style. I found Valerie through the recommendation of another curly hair friend. THANK YOU!!! Valerie can cut anyone's hair!!! If you can cut curly you can cut hair. She is not a one hair cut woman. I have gotten compliments where other woman have stopped me to ask who cuts my hair. Go to her. You will be happy. Since I have been going to Valerie for a long time, my hair repaired, and now I have her cut my hair so I can blow dry my hair when I want. She honestly can cut hair no matter if you are curly or not. I highly recommend her. Valerie is an exceptional stylist and colorist, she makes you feel right at home with her friendly bubbly personality. I recommend that you give her a try you will surely make another appointment upon leaving your visit. Solo is a cute little shop near the Acme. The owner Valerie is friendly and funny. She makes me laugh. She is a talented stylist who knows how to cut thick,wavy hair. Val has a sign that readsI am not a magician, but actually she is. I encourage you to let her work her magic on your hair! !